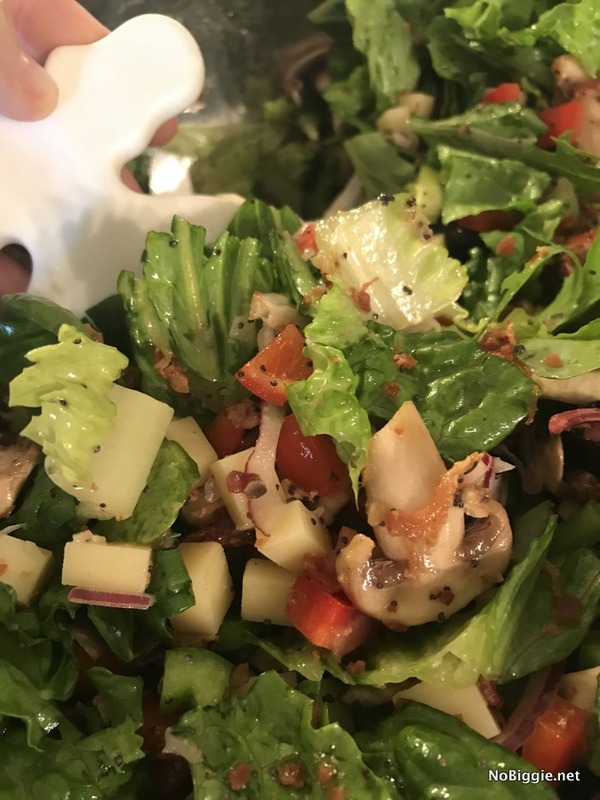 Bacon Mushroom Swiss Green Salad…this salad is loaded. Don’t you love a good salad?! 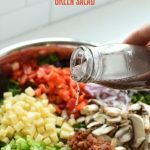 Summer has me craving salads, and this is a good one! 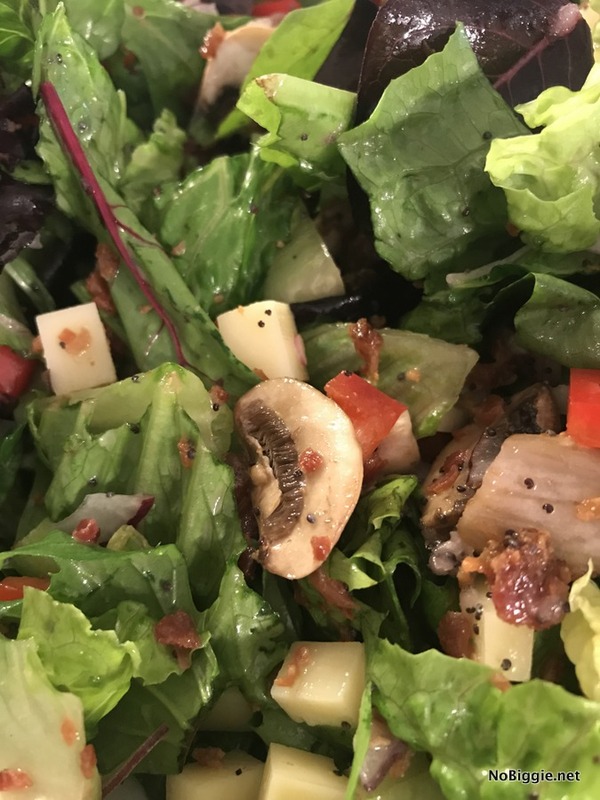 It’s a loaded bacon mushroom swiss green salad with a homemade poppy seed dressing. It’s one of those salads that could totally be your entire meal. It’s that good! My neighbor recently shared this recipe at a church get together, and I’ve made it a few times since, it’s my new favorite! One of my new favorite short cuts is using the precooked bacon bits from the store. I’m not referring to those crunchy little bacon flavored bits, this is actual bacon. Costco sells it in a big bag, and you can find it at your local grocery store on the salad dressing isle. It’s a total time saver and so good in this salad! 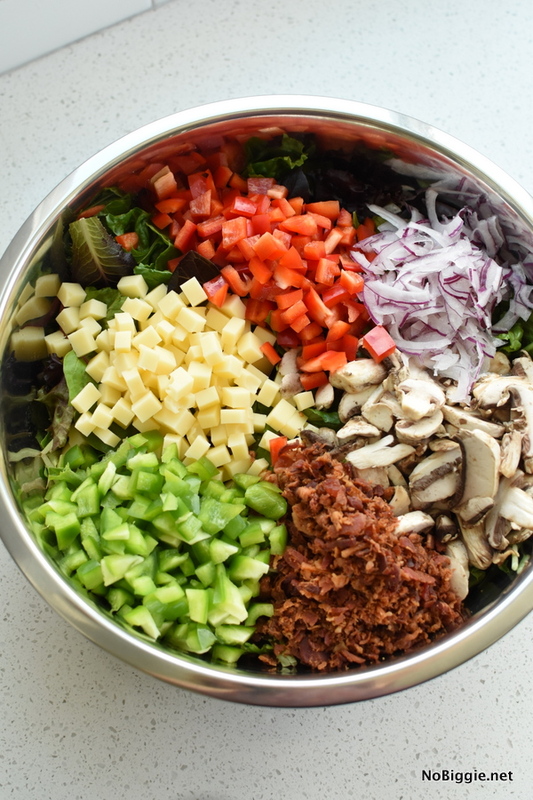 Leafy greens, mushrooms, salty bacon crumbles, and Swiss cheese come together in this salad that is packed with flavor. The homemade poppyseed dressing is the perfect sweet addition to toss it all together. 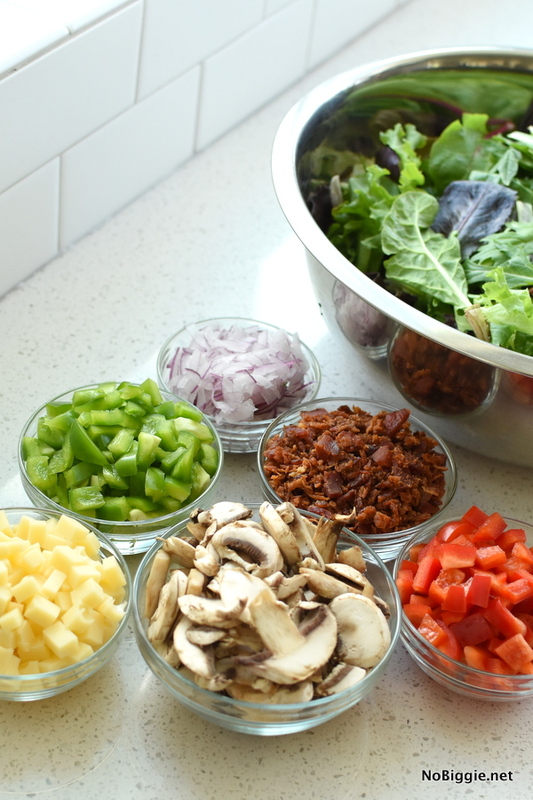 Layer all salad ingredients together and keep chilled in a big bowl until ready to toss and serve. 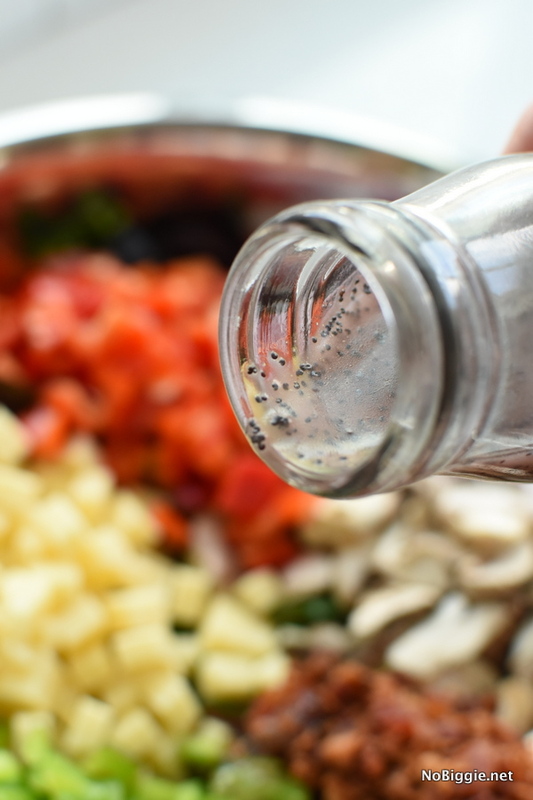 To make the homemade poppyseed dressing, mix all salad dressing ingredients together until creamy. 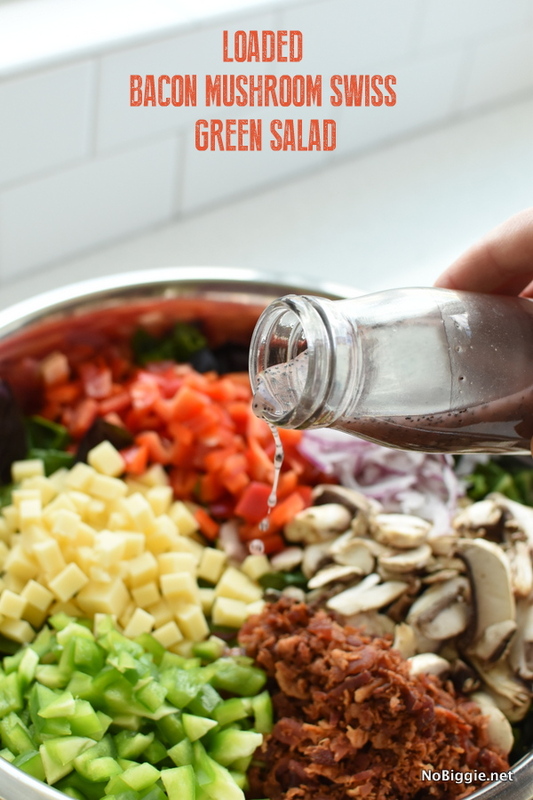 Add dressing to the salad right before serving. Enjoy! This salad comes together pretty quick. You can totally make it ahead and keep it chilled in the fridge until ready to serve. Add the dressing right before serving. One of my most favorite (and most dangerous…if I’m being honest) kitchen tools is this handheld ceramic mandolin. It’s my favorite way to get super thin slices of onion, because the flavor of the purple onion is so good in this salad, but I’m not an onion fan and I don’t want to bite into a big chunk of onion. With the mandolin you can slice super really thin. There is a dial on the back where you can select the thickness which is so cool! Just be so careful, I’ve had a couple injuries over the years because it really is so sharp. It comes with a guard, so it’s a good idea to use the guard.